It’s a minefield of mismatched plans, locked phone and gotchas when it comes to purchasing a 16GB iPhone. The following is a summary of the major offerings 0.5-1Gb data allowances, assembled with a the help of a couple of friends. Value is best assessed on the basis of a Total Cost of Ownership (TCO) over a 24 month period, however, you might choose a longer period, or a different criteria (like coverage). It seems that thet Virgin Mobile plan is the best choice, even considering it’s reduced coverage and higher call rate. The Three plan is a close second, but a hassle to go through the outright purchase. I hope this saves you the hours of time it took me to dig out the information. The key difference between the 3G networks is latency (the delay or ‘turnaround’ between server request and response). APCMag ran a series of tests which showed that Telstra and Three are far superior in this area, and also in download speed. Here’s a comparison of the data, as well as useful commentary on the results. Latency is certainly the difference between a positive and negative web browsing experience on a desktop, so I’d suggest it will similarly be a make or break experience with an iPhone. In short, Three is good value now, because it’s limited (now). It may be that in 12 months, if they [seamlessly] hook up with Telstra’s far superior NextG network, that Three will ratchet up their prices to a) compensate for their rent to Telstra, or b) consider that the higher value service is suddenly able to be billed at an elevated rate. Three is, IMHO, one to watch, but presently not a contender. By the way – all of these numbers compare favourably to my current plan (without an iPhone) for which I am currently committed to the tune of $1896 (and that doesn’t even include phone costs!). 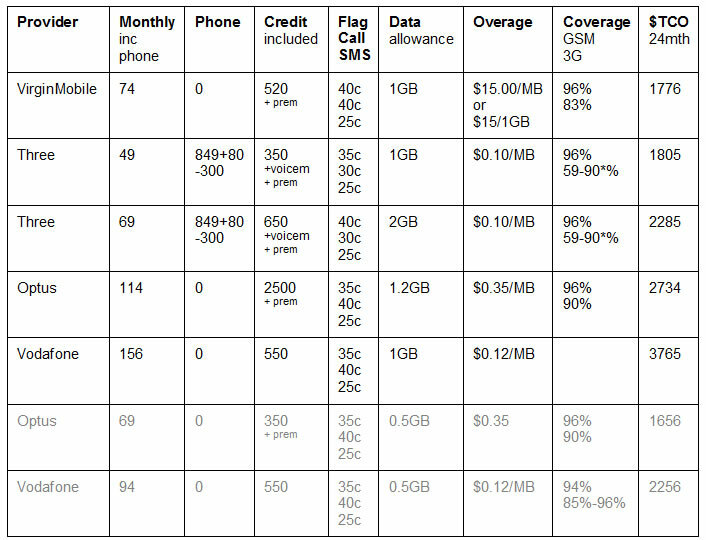 Update: February 2009 – VirginMobile has excellent billing features, however they do not include 1800 numbers in the cap (why, I’ve no idea!). The Optus network is terrible – even in metro areas, one regular gets the “No Service” status and “Service Disconnected” error from the iPhone. Update 14th July 2009 – An excellent plan comparison tool can now be found on the The Numbers in A Flash website, there’s even a special page just for iPhone plans. This tool would have saved me a ton of time (had it been around last year). Of course, price comparison has nothing to do with quality of service or coverage (Telstra undoubtedly has the best mobile service, but you pay for it). Thanks Natasha! the iPhone 3G looks very cool and feature packed. i will be saving some of my allowance to buy that phone. iPhone 3G is best phone ever released. it has great styling and has nice cool features that is why i like it so much. Iphone 3G have the best features among all the phones that i have owned. the iPhone is also very classy and stylish. the first batch of iPhone 3G was a bit pricey but now the price is more affordable than before. I bought two units of iPhone 3g and i am amazed of this phone. Great write up. The iPhone is truly awesome and I don’t like being without it. This time last year I had jumped in a pool with my iPhone and it was dead. I had to wait 9 days before I was able to buya new one. The phone I had was a cheap go phone. I really love all the games that can be downloaded to the iPhone. The best part about the iPhone to me is the ability to check emails on the go. Thanks for the information.